Anaheim (October 25, 2018). 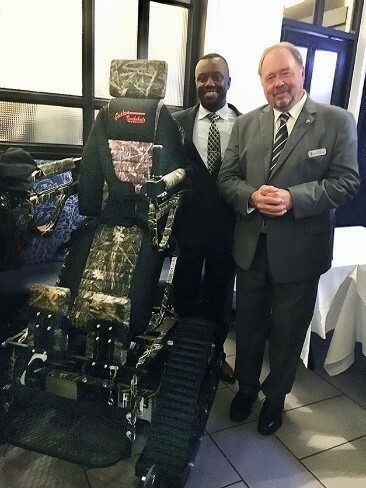 National Technical Systems, Inc. (“NTS”), the leader in qualification testing, inspection, and certification solutions in North America, is pleased to announce its donation of a high-tech wheelchair to the Wounded Warrior Regiment. At a customer reception held in conjunction with the Association of the United States Army (AUSA) trade show in Washington D.C., NTS donated a state-of-the-art Action TrackStander to the Wounded Warrior Regiment. The Action TrackStander is an all-terrain wheelchair that allows severely injured service members to enjoy outdoor activities such as hiking and fishing. “The generous donation from NTS provides added mobility in outdoor spaces to a soldier who lost one of his legs in Iraq,” said Willie Jordan, Program Manager at the Wounded Warrior Regiment. “The Action TrackStander allows him to stand upright or sit comfortably while traveling across rocky terrain,” continued Jordan. The Wounded Warrior Regiment is a Marine Corps organization that is dedicated to helping injured Marines and Sailors return to pre-deployment lives. 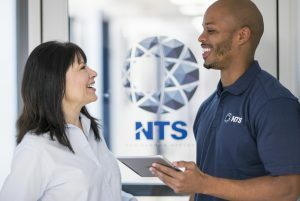 “We consider it the highest honor to donate a life-changing gift to the Wounded Warrior Regiment,” said Dave Mann, Senior Vice President of Operations at NTS. The recipient of the wheelchair is a former U.S. Marine Corps Corporal who lost his left leg, ruptured his eardrums, and suffered severe shrapnel wounds throughout his body.